This thread is fun and full of good stuff. In a real way we are creating a living growing text. It is not always like that on forums. The only deficit is that posts appear from one, then another, and that they over lap without interactive vibrancy of face to face talk. None of us holds a truly contradictive view with the other but we dont have the opportunity to see that in each other's eyes or hear it in each others voices. The enthusiasm and pleasure of sharing and exploring such wonderful topics with people who are like ourselves - people who take care of serpents. i'm picturing something like an ant farm. A tall, wide, pretty flat enclosure with a full- or nearly-full width fake-rock wall up almost the entire back, with a flattish top ("big ledge"). Something suggesting limestone, with some horizontal layering to the cliff face. A few holes through the "cliff" opening into pockets or "caves" on the back side, which have clear doors. Or opaque doors with a peephole built in. These caves at different heights, offering a temp range. One with sphagnum or some other humid substrate. Good strong LED lights shining down on a plant or two, planted in a void (substrate LECA? growstones? Turface?) in the upper third of the "cliff" - a climbing Aloe, or maybe a Hoya or Beaucarnia or Sanseveria. Something tough, xeric, spineless. Progress...tonight marks the second consecutive week the suboc has taken a quail and colored mouse without needing to thaw/boil them together. I simply let them thaw to room temperature and she eats them within 20-45 minutes of introducing them into her enclosure. I think I have three quail left now. I don't think I'll have a problem having her eat solely mice once the quail run out, and I'm confident her weight is going to be sufficiently increased by the end of this month that even if she were to refuse food she'll be OK to cool down for the winter. She's still very friendly/inquisitive. Thats great Chris - I hope you keep us updated on her and just a note, if you thaw your feeders in firmly warm water you get a nice, fresh, warm animal to feed. It greatly expedites the thaw and eliminates the mild spoil that happens with room temp thawing, which isnt so much of a health hazard really to a snake, but it does start to happen while still partially frozen, and a fresh corpse is what a snake most commonly eats. Its not too complicated, just tap water in a tupperware container, no need to monitor the temp as you arent going to offer it hot, the water itself drops rapidly and when it feels pleasantly warm and pliable to your thumb under the rib cage - fresh, clean, ready to feed. If you are a measurer by nature, 105 to 110 F starting point will do the trick, by the time it thaws, the mouse/quail and the water will be significantly cooler. With a much shorter wait. I'd kill to see some nocturnal video of suboc forage behavior at night. It would be a cool albeit daunting project for someone if they had the equipment - i would think it possible. Im guessing there are little night capable cameras? Day guys too, I think about Zonata moving in and out of boulder crevices, waiting, leaving, creeping back, then snagging a scelop as it slips sideways in a cool shadow. The realm of cryptic life separated from our sight by layers and tons. Kelly Mc wrote: I'd kill to see some nocturnal video of suboc forage behavior at night. Absolutely, just like the night-vision-goggle-looking cameras they use on the African plains. I'm not referring to the "classic" infrared cams, which would be nearly useless for a herp situation, but rather the ones which give a green-tinted output (yes, technically they get into the "near-IR" range of the electromagnetic spectrum, but they're mostly amping-up what available visible light there is). Here's an example...Sony used to make video cameras with a NightShot function which basically shot a beam of IR light not too far off the visible light spectrum, to allow the camera to amp-up the image without overdoing it (due to lower ambient light levels) which would result in scintillation and "graininess" of the final photo. 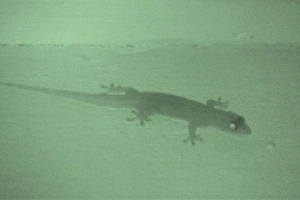 This is a still from such a machine, of a Gehyra in Malaysia from about 15 years ago. I don't know if anyone in the consumer market still makes a similarly-capable device, but they can be fun to play around with. That would be totally enough of a good image to capture behaviors..! That would be really cool for someone to get obsessed with - i would imagine some careful, careful editing skills among others, time lapse etc but thats in excellent supply here - it should be done!! Kelly Mc wrote: That would be totally enough of a good image to capture behaviors..! It WOULD be...but it's very, very cost-ineffective, both in time, effort, and money. MOST subocs I've found have been on the road surface and not "foraging" per se. I supposed a person could just watch them the rest of the night, but that would take a lot of will power for the average West TX herper (myself included!) since most of us have other species we'd like to see in the generally-short amount of time we get to spend out there. Just getting out to the area--food, gas, lodging, and then timing and time--eliminate many of the folks who could make it happen. But it is an intriguing idea. Let me clue a suboc aficionado in on this discussion and see what he thinks. This is an after-thought, a long after-thought . This is in "for what it’s worth" category. As you know, young coachwhip diet, at least in Florida, is primarily lizards and small snakes then a host of all others (baby birds, large insects, small rodents, etc.) The calcium content in lizards and snakes is much higher than other prey. Even the mice they eat are primarily the Peromyscus group. It is apparent that protein and calcium is significantly higher in Peromyscus and lizards; though not tested, fat is probably lower. Anecdotally, by adding a pinch of calcium with D3 to F/T mice, I seemed to get better growth and eggs from my Kingsnakes and other lizard/snake eaters. Since snakes get their Vitamin D from their food, not UVB, combining calcium and D3 may be a worthwhile supplement for this species. That isnt true Bill. Actually - All animals "get" D3 from their food.. There is nothing "special" about snakes in these capacities. Somehow in keepers minds, perhaps infused by turtles and lizards bone developmental reliance on conversion, that because snakes do not require photobiotic d3 conversion for tissue development, like pet turtles and lizards, that snakes are 'uniquely designed' to "get D3 from the liver of their prey" which is simplistic and inaccurate. In keeping snakes of many species with and without uvb the observation that they repose themselves out of their hides more frequently has been substantial. The shed rate of mature individuals that bask with greatest regularity approaches shed rates per sub adulthood in snakes raised. I am not saying it is "Better" its just noted. If I were to examine my core motive for including it, I would have to say it is to break the complete absence of it in indoor conditions. I would also be curious to know if the shed rates of snakes that receive ultraviolet contact in captivity more closely resembles snake shed rates in wild situ. I understand this is a strong opinion that you have, and I respect it, but I see no proof to support much benefit to introducing UVB lighting to snake cages, even after reading the other UVB post. We’re going to have to agree to disagree on this one. You're right in that I misspoke saying "Since snakes get their Vitamin D from their food, not UVB, combining calcium and D3 may be a worthwhile supplement for this species." I should have amended it to say that UVB has not been proven a significant factor in snakes synthesizing Vitamin D, as opposed to turtles and lizards, so calcium with D3 seems like a good supplement for growing youngsters and breeding females. The studies show only a marginal increase in Vitamin D by Corns being exposed to UVB. Bottom line is that if you don’t take UVB seriously in Lizard and turtle husbandry, many deleterious events will occur. If your captive, vertebrate eating snake never sees a light that emits wavelengths of 280 to 315 nm, it will still thrive, and , if kept properly on all other facets, and will see a long life. This Baird’s Ratsnake regularly forages hunts and basks in these lights, but all lights are LED that operate in the 400 and 800 nm with trace amounts down to 380 nm, including the spot light. She never sees UVB wavelengths and grows, thrives, breeds, etc. But the increased filter effect of the increased keratin in snake skin has to be considered as a different. It isnt a strong opinion but the description of a practice thats not unlike any other provision, but for some reason makes people respond with automatic contention, even if they have never actually used it. The study involving Corn Snakes proved that UVB is converted per plasma to 25-hydroxy vitamin D, and conceded to its own limitations of design. There is no evidence that 'More' is desired, a marginal increase in levels proved there is no mechanism or inability to its process, similiar to many other organisms. Before Led lights popularity, some keepers used incandescent lighting (and still do) to augment a day cycle in their charges. Using UVB-including lighting does the same in defining the photoperiod but with normally encountered wavelengths that replicate daylight contact. It is also self mitigating, unlike oral supplementation which can only be guessworked in application to avoid toxicity. I have used the same lighting with birds, and even mantids and some spiders, and have for many years as a part of non domestic animal husbandry and rehabilitation. It is interesting how UVB use in snake environments Always, Always gravitates around D3 and lizards and turtles, always repeating that there are no deficiencies with snakes that eat whole prey, how they can live without it, when no where ever have I said I used it for that purpose. That is not why I use uvb lighting in the environments of my favorite snakes, or snakes I wanted to daycycle with more attention or set up for others. I have mentioned Photobiology in interdisciplinary addition to animal husbandry, as well as Neuroethology. Herpetoculture is a great opportunity to learn and incorporate many things that we wont find in the usual places. It makes the interesting even more interesting. Beautiful Bairds.. excellent life I know she must have. I also would like to recognize that although you might not want to come right out and say it, you would have an intuitive precision about supplementing as you mentioned. Its the ability to measure on the sharp wing of experience. I read a few things, but I have been MIA for a while. My apologies. I'm not sure where I left off, but the little guy is alive and well, happy with his diet of brown anoles. He's up to 2-3 of them a week, and I offer a basking light 3-4 days a week as well, keeping the metabolism up. The days he doesn't have is light because the light is on the neighboring cage, a 3'+ coachwhip I've had since October. The larger whip readily eats f/t mice as well as live anoles. They are both collected from two different areas, but both are FL examples. I'm thinking that at some point the little guy will grow big enough to switch to mice naturally. I wanted to test this by seeing what a larger whip eats and I'm almost sure of it now. The little guy has just about doubled in length since I got him and I see no signs of him slowing down. Also, what I found very interesting is that neither whip took live baby corns. I offered off and on for 3 weeks. The smaller whip did eat a small corn shortly after I acquired it, but this time there was no interest at all. I also offered the larger whip quail eggs and there was no interest in them either. I'm glad my thread started such an interesting discussion! Glad to hear from you again and that your coachwhip is doing well. yeah its weird how an accepted item is refused (baby corn) sometimes it isnt really even the food item but some other factor or difference in scenario or encounter that results in a pass. Im really happy everything is going well, but admit I had a personal interest in having you work my scenting technique - it creates an interesting subject opportunity. I suppose many people keeping a coachwhip would have an easy time catching lizards for it but there are those who may make a snake acquisition with less locality favor - and the price of buying feeder lizards and their health hygiene could use an alternative. To the spirit of herpetocultural adventure... we've only scratched the surface. Im sure of it. Just another after, after thought, Noah. You seem to be doing well with the animal. Grasshoppers and cicadas from areas you trust to not have insecticide are taken often in the wild. (Starting hatchling Northern Black Racers, also primarily a sight feeder, is also easier when they take crickets. Since its spring, small frogs could be a readily available prey, if readily accepted, and easier to scent over to mice.